Small pumpkins are good for both decorating and eating. Pumpkin is a term applied to the round, orange fruits produced by varieties of the species Cucurbita moschata, Cucurbita pepo, and Cucurbita maxima. 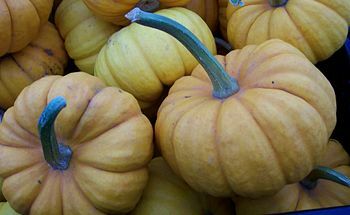 Pumpkins are types of winter squash, ripening in the early autumn, and being harvested and eaten after the rind hardens. They are not derived from a common ancestor, but developed separately from the various species of squash which they represent. Pumpkins were developed in what would later be northern Mexico and the southern United States in pre-Columbian times, and are grown today throughout North America and Europe as food for both humans and livestock. The pumpkin enjoys an especially high profile in the United States, with the jack-o'-lantern a symbol of Halloween and pumpkin pie being a traditional Thanksgiving dinner. Some larger varieties are cultivated in the US with only Halloween decorating in mind; smaller pumpkins intended only for eating are distinguished as "sugar pumpkins". The pulp of a pumpkin, and sometimes the rind as well, can be used like other squashes, as a vegetable accompaniment to a meal. It is also used to make soup, pudding, and, especially at Thanksgiving, pie. The seeds are also edible when roasted, but outside Mexico (where they are also used, ground, as a thickener and flavoring for sauces) they are not eaten much. Pumpkins, as well as different types of squash can develop inside a plastic mold. When the squash has reached maturity, it will resemble the shape of the mold. Additionally, around Halloween in the United States, pumpkins are hollowed out(often the innards are kept and cooked) and "carved", resembling faces or designs. Contests exist for those that can make the most technically creative design. This page was last modified 14:49, 27 October 2010.